'One of a Kind' Jewellery is eye-catching, contemporary, and made using materials including: Swarovski crystals, lampwork beads, fresh water pearls and Czech designer glass, which are often suspended on quality sterling silver Beadalon wire. Own something unique that will be made once and only once. Commissions welcome, please contact me. 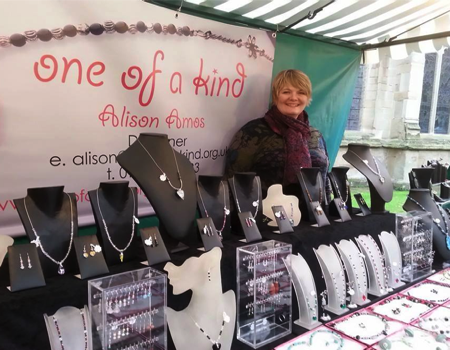 One of a Kind displays and sells unique handmade jewellery at arts/craft markets in Worcestershire, Herefordshire and the Cotswolds, including Worcester, Malvern, Cheltenham, Cirencester, Tewkesbury and Hereford. See our Events page for this year's schedule. All One of a Kind Jewellery comes with a money back guarantee.